Anna and Benjamin discover the secrets of the forest and its animals, set around a 300-year-old oak tree. A beautiful seasonal story. 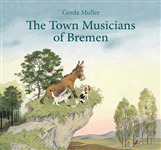 A beautiful new edition of a classic Brothers Grimm fairy tale, from much-loved illustrator Gerda Muller.